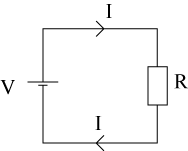 The diagram shows a simple circuit: the cell provides energy, V volts, which causes a current, I amps, to flow around the circuit. There is also a resistance, R ohms. This circuit provides a simple model for what happens in an electric kettle: a resistance converts electrical energy into heat energy by impeding the flow of electrons around the circuit. The table shows data collected from a circuit like this. Draw a graph of this data, with the resistance on the horizontal axis, putting a straight line through the points. What resistance would you need to heat water to 100 C°? What would the temperature be if the resistance was zero? Do you think that in practice, any circuit can have zero resistance? Physics. Mathematical modelling. Graphs. STEM - physical world. Biology. Gradients. Investigations. Graph plotters. Chemistry. Maths Supporting SET.